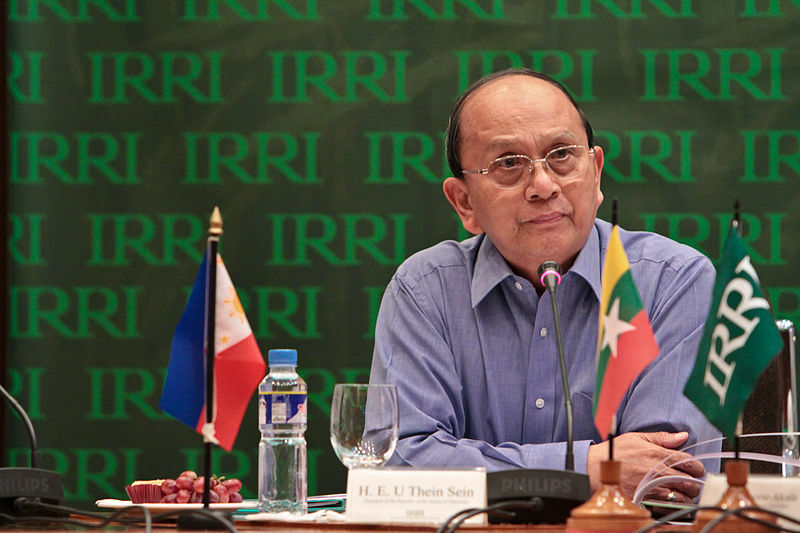 On February 12, 2015 Myanmar President Thein Sein, prompted by protests led by Buddhist monks in Yangon, reversed a decision made ten days earlier to give voting rights to the country’s Rohingya population. The reversal, while surprising to some, was only the latest in a series of events to befall the Muslim minority who call western Myanmar’s Rakhine state home. The Rohingya of Myanmar (also known as Burma) have lost more than voting rights in the past. Regarded as one of the world’s most oppressed peoples, the Rohingya are a distinct ethnic group that speak a dialect of Bengali and are thought to be descended from Arab and Persian traders. Under the military junta that ruled Myanmar for most of the latter half of the 20th century and the current, nominally civilian government, Myanmar’s Rohingya have suffered chronic poverty, food insecurity, harassment and forced labor, among other human rights abuses. Following Burma’s 1982 Citizenship Law, hundreds of thousands of Rohingya were denied citizenship and are still referred to as ‘aliens’ and ‘foreigners’ by government officials. They are neither allowed to travel outside their hometown nor marry without official approval. Poor relations between the Muslim Rohingya and their neighbors have only made things worse. Tensions between Rakhine state’s Muslim population and the majority Rakhine ethnicity, who are Buddhist, boiled over in 2012, leading to anti-Muslim riots that spread throughout the country. In Rakhine state alone, over 200 people were killed and whole villages were burned to the ground. Conditions have not improved for Myanmar’s Rohingya population since then. The current boat crisis of thousands of Bengali and Rohingya refugees stranded off the coasts of Thailand, Malaysia and Indonesia is a consequence of awful conditions at home. The Rohingya, however are certainly not the only group struggling in Myanmar. Despite what appears to be a nascent democracy, a civil war between the government and an array of armed ethnic groups along the country’s periphery has flickered continuously since the 1950s. The reasons for the conflicts are many, though issues of ethnic autonomy and control of precious resources like jade and timber loom large. The conflict’s latest iteration began in February 2015 and is still ongoing. A flare up of tensions between the Myanmar Army and Myanmar National Democratic Alliance Army (MNDAA) in Kokang, Shan State, has killed hundreds and forced tens of thousands of civilians to flee across the border into China. Many Rohingya have also left Burma in the past decades. Tens of thousands of them reside in ill-equipped refugee camps on the Myanmar-Bangladesh border, though others have escaped to new lives abroad. Their final destinations vary, but the majority resides in Saudi Arabia, Malaysia, Thailand and Pakistan. Of these Rohingya living overseas, who may number over one million, most work low-wage jobs in the construction and service industries. There are some, however, that have chosen a different path in a land closer to home. Eight hundred kilometers east of Rakhine state in Jinghong, China, Abedullah owns a small jewelry shop. It’s three o’clock in the afternoon he hasn’t sold a thing. Abedullah, like almost one million of his compatriots in Rakhine state, is a Rohingya, but he has not lived there in thirteen years. Instead, he’s settled in Jinghong, the capital of Yunnan Province’s Xishuangbanna Dai Autonomous Prefecture, along with almost 600 other Rohingya. All of them sell jade. According to Abedullah, who only agreed to give his first name, Rohingya merchants first came to Jinghong almost forty years ago. Following the end of the bloody Bangladesh Independence War in 1973, hundreds of thousands of refugees fled into neighboring Burma. Marginalized by the Burmese and eventually disavowed by the Bangladeshi government, tens of thousands of Rohingya fled overseas. A handful made it to southwest China’s Yunnan province. Stories of Jinghong’s first Rohingya are hard to find and by all accounts, the number of émigrés remained small until the 1990s. It was then that the Chinese economy began to truly open up to the international market. As trade increased and more Chinese became wealthy, the country’s jewelry consumption level grew as well, skyrocketing over 4000% in a decade. While all gemstones have grown in popularity in recent decades, none hold the place in Chinese culture that jade does. Regarded as a stone of mystical qualities since antiquity, jade is the king of gemstones in China and it is in Myanmar that the world’s highest quality jade is found. 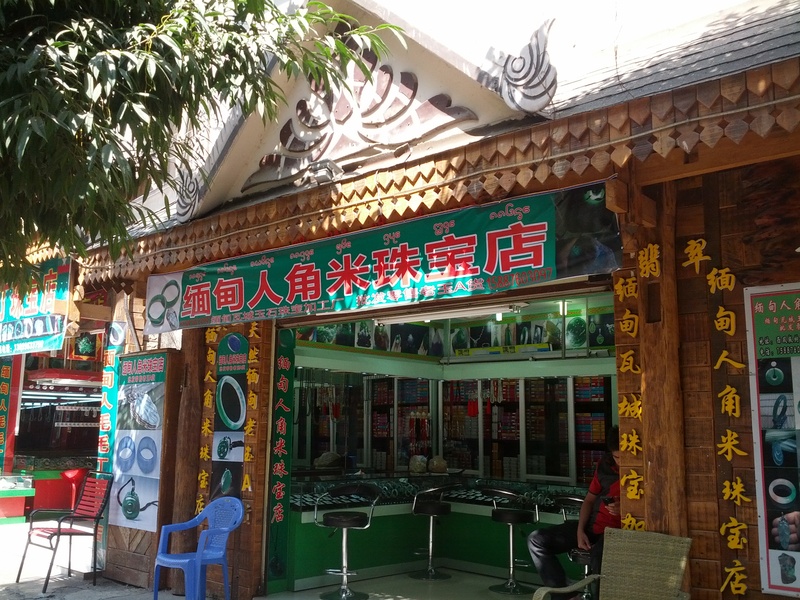 As a result, jade shops are ubiquitous in dozens of towns along the China-Myanmar border. Jinghong is one of the largest. Straddling the Mekong River, this once sleepy town has grown into a city of six hundred-thousand and now hosts millions of tourists each year. Many of these tourists come looking to buy Burmese jade. As travelers have flocked to Jinghong in greater numbers in recent years, Rohingya merchants with connections to the Burmese jade trade have followed to keep up with demand. One of the recent arrivals is Xiao Fei, a 21 year-old who prefers his new Chinese nickname to his given name. Xiao Fei, like many other Rohingya in Jinghong, came at the behest of his family; his grandfather first arrived in the city almost thirty years ago. After saving enough money for a passport, Xiao Fei was able to leave his home in Yangon and help his grandfather set up the family’s second shop. Once in Jinghong, new arrivals find an environment altogether strange and inviting. The forest of newly-built apartment complexes and hotels certainly dwarfs anything found in Rakhine state, however the hundreds of established Rohingya businessmen form a tight community that provides everything from religious services to a lunchtime delivery service of halal Burmese cuisine. It is the mosque that is the heart of the community, says Waynai, a trader living in Jinghong for six years. 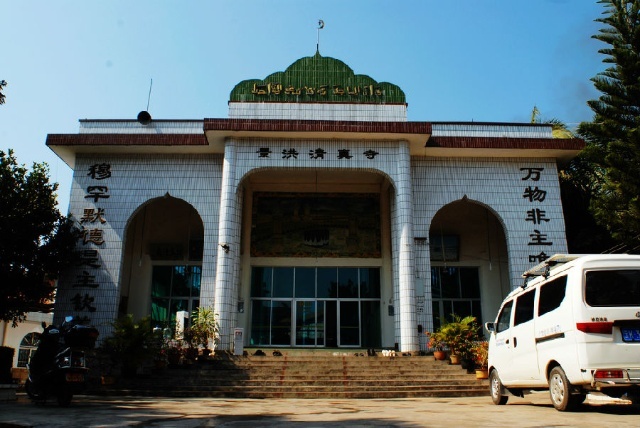 The Jinghong Mosque, located not far from the banks of the Mekong was first established decades ago by the city’s existing community of Hui, a distinct ethnic group of more than ten million people that practice Islam and speak Mandarin Chinese. When the Rohingya began to move to Jinghong in greater numbers in the late 1990s, they became a part of the congregation, eventually joined by a small population of Uighurs from China’s northwest. Together, these three groups of Muslims manage the congregation. Despite disparate geographic and cultural backgrounds, the mosque is thriving with a healthy number of members, daily prayers held in Arabic and discussion groups where participants speak in Standard Mandarin. “It’s because of [the government] that we’re so backwards now,” he says in a whirlwind of English, Mandarin and Jinghong dialect, slapping the table after each word. After five minutes of browsing, the wife still has not decided on a piece and the husband, fidgeting, suggests heading back to their hotel. The couple leaves and Ba Hlaing sits down to light a cigarette. “That’s how it goes,” he sighs. Just like Abedullah, business is slow for Ba Hlaing, even during tourism’s high season. Ba Hlaing believes the drop in jade sales is a consequence of Chinese President Xi Jinping’s much-publicized crackdown on corruption. Once-popular ostentatious displays of wealth, like jade pieces worth tens of thousands of dollars are now frowned upon and officials that might frequent jade shops like Ba Hlaing’s are staying away. The jade, however, keeps flowing from Myanmar. Most of it is mined in a strip of remote jungle in Kachin State, in the country’s northeast. Conditions in Myanmar’s jade mines are notoriously dangerous and the towns that spring up around them are known as much for their drugs and guns as they are for their jade. However bad mining conditions are though, the money can be worth it for those who can make it. Official figures from Myanmar’s government put jade exports at $1.4 billion between 2011 and 2014. Analysts from Harvard University’s Ash Center disagree, estimating jade sales – both official and off the books – at $8 billion for 2011 alone. 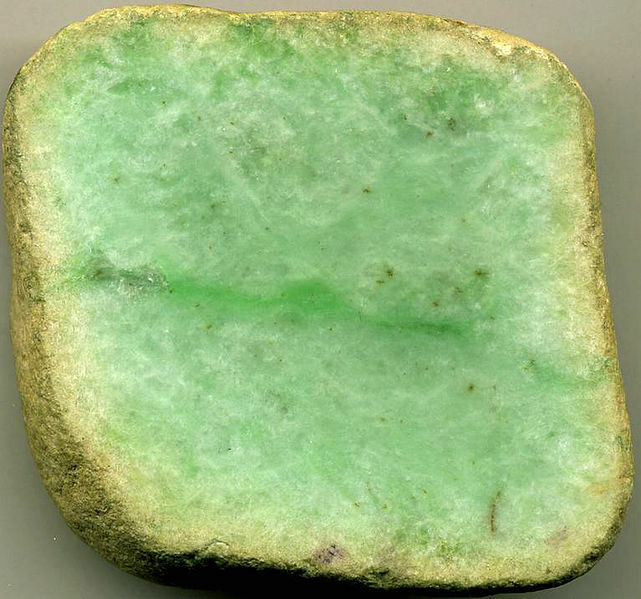 Once the raw jade has been extracted, it is sent to processing centers. The majority are located within Myanmar, in urban centers like Mandalay and Yangon, where the jade is polished and crafted into a final product. The next step is to get it into China, where the market is. Most traders interviewed for this article admitted that the majority of the jade they sold was actually smuggled into Yunnan. A few well-placed bribes on both sides of the border can get shipments of jade, transported in trucks, into China reliably. Once the jade is in Yunnan, it usually makes its way to Ruili, a major border crossing between China and Myanmar. According to Ba Hlaing, many Rohingya traders in Jinghong have a contact in Ruili, usually family, that buys the jade. Others, however, are directly connected to processing centers, most often in Yangon. For more valuable pieces, with sale prices upwards of $50,000, many traders will use air transport to ensure their safe arrival. While import taxes must be paid in these cases, the extra cost is often worth the peace of mind. Peace of mind, however, is getting harder to come by. With a slowdown in business and mounting issues back in Myanmar, many members of Jinghong’s Rohingya community are facing a tough decision whether or not to return home. Ba Hlaing, for one, is planning on going back to Myanmar. Sales have decreased for the past two years and he fears that a protracted crackdown on corruption in China will keep jade sales low and prevent his shop in Jinghong from making a profit. Abedullah, on the other hand, does not share Ba Hlaing’s optimism. He does not want to return to Myanmar and sees little hope for democracy delivering the Rohingya from oppression. Will Feinberg compares Xishuangbanna’s rubber and sustainabilty in two of southern Yunnan’s ethnic villages. One monocrops while the other hedges. Driving past new stores and half-built housing developments, you take a right into the forest. Keep going. The farther you drive, the worse the road gets until you burst through another patch of palms trees and cross a stream. Where are you? You’re in Mandian Village, just outside Jinghong, Yunnan and right in the heart of Chinese rubber country. Introduced to the area in the 1960s by the central government, rubber is big business in southern Yunnan. Large state plantations have steadily given way to private enterprises and the region has seen a proliferation of rubber planting in the past twenty years. Today in Xishuangbanna Dai Autonomous Region, which Jinghong is the seat of, rubber plantations already make up almost one fifth of all land. While the environmental costs have been heavy, the rubber explosion has done wonders for Xishuangbanna’s economy. For rubber farmers in Mengla Country, for instance, the average household income is close to $30,000/year, comparable to places like Shanghai or Guangzhou. The economic benefits of rubber harvesting were quite clear to me while traveling through the region late last month. During the trip, I visited two villages that I had been to in 2011. In both cases, rubber has transformed the local economy, however one village was clearly better off than the other. Why? The first village I visited was the aforementioned Mandian Village. Mandian is largely inhabited by people of the Dai ethnicity, with a 20-family group of Yi people living in an adjacent settlement. Mandian, like many other villages in the area, practices rubber cultivation and relies on rubber as its main source of income. According to villagers there, the Dai started harvesting rubber over a decade ago, while the Yi settlement began their rubber industry only within the last few years. For the village economy as a whole, rubber has had a positive influence. Per capita incomes have risen as well as household consumption and the money from rubber has allowed the town to build a new school. However, as rubber is Mandian’s only cash crop, the village’s fortunes are now beholden to the world rubber market. Nothing illustrates this better than what happened to the village in 2012. Last year, the bottom fell out on the rubber market and the price of raw rubber dropped by half, going from 30 yuan per pound (1 US dollar is roughly equal to 6 Chinese yuan ) to 15 yuan per pound. Two villagers that I interviewed described the effects. One, a middle-aged Dai woman told of how most of the villagers who harvest rubber had to work overtime to scratch out living and the quality of life dropped for many families. Though because the Dai also plant rice, no one in the village went hungry. A young Yi woman that I spoke to also described how the economic hardships as a result of the rubber crash delayed the building of their house. The Yi, who were recently resettled as a result of the building of the Jinghong Dam, were forced to return to their old fields as a way of producing food during 2012 crash and without these fields, many villagers might have gone hungry. The fall of the rubber price in 2012 was not isolated just to Mandian village. The drop was felt in villages like Mandian all over southern Yunnan and in other rubber producing areas like Malaysia and Brazil. But there was at least one village that was comparatively isolated from the crash’s effects. Nanpanzhong Village sits on the slope of a ridge just an hour’s drive from the Burmese border. A collection of some 120 families, Nanpanzhong is an Aini village. The Aini are a branch of the Hani/Akha minority, a nomadic, transboundary ethnicity that typically practice subsistence agriculture in the mountains of Southeast Asia. What makes the Aini of Nanpanzhong special, aside from their incredible hospitality, is their economy. Like the Dai and Yi of Mandian, the Aini also harvest rubber, but the role that rubber plays in the village’s economy is quite different. In an interview with the village mayor, I learned that money from rubber harvesting makes up only 30% of the town’s income. Instead, their primary source of income, by a long shot, is pigs. The town raises hundreds of short-eared swine which command quite a high price in China’s metropolises. According to the mayor, his pigs’ pork sells for 130 yuan/pound, many times higher than the price of normal pork. In fact, most of the village’s pork can only be found in places like Beijing, Chongqing and Shanghai; people in Jinghong can’t even afford it. Pork sales now net the village almost sixty percent of its total income, but Nanpanzhong’s foray into the meat industry is a rather recent affair: villagers only began raising pigs in 2003. Its impact, however, has been astounding. According to the mayor, the average household income was hovering around 500 yuan per year at the turn of the millennium. Thirteen years later, that number as skyrocketed to almost 8,000 yuan and now, the mayor claims, Nanpanzhongcun is the envy of the surrounding valleys. When the rubber price plummeted last year, Nanpanzhong was largely unaffected. Of course, the mayor explains, villagers feel the effects when the rubber price fluctuates, but certainly less so than other places. The village is largely self-sustaining for food and the money earned from rubber, livestock and tea (which makes up a tenth of the village’s income) is used for electronics, vehicles and building materials. Both the mayor and villagers that I spoke with were convinced of the Nanpanzhong model’s superiority. The evidence is hard to disagree with. Not considering the environmental concerns, of which there are many, rubber can be an unsustainable enterprise. Mandian, and hundreds of villages like it, have had a mixed experience with rubber. While it brought the village a new school and the villagers a higher standard of living, Mandian’s reliance on rubber and the fluctuations of the global market brought hardships to the village last year, forcing some villagers to leave in search of food. On the other hand is Nanpanzhong’s model. Rubber, while an important source of income for villagers, is part of a healthy balance. With families growing their own food and relying on two cash crops (rubber and tea) and livestock for their income, the villagers of Nanpanzhong are largely insulated from greater trends in the rubber market. The village’s exact model may not be able to be replicated in every village in Yunnan, but its general ideas can. Pairing rubber with a second cash crop and agricultural self-reliance are concepts that could give protection to villages like Mandian and offer a more economically sustainable path for thousands of people in the region. 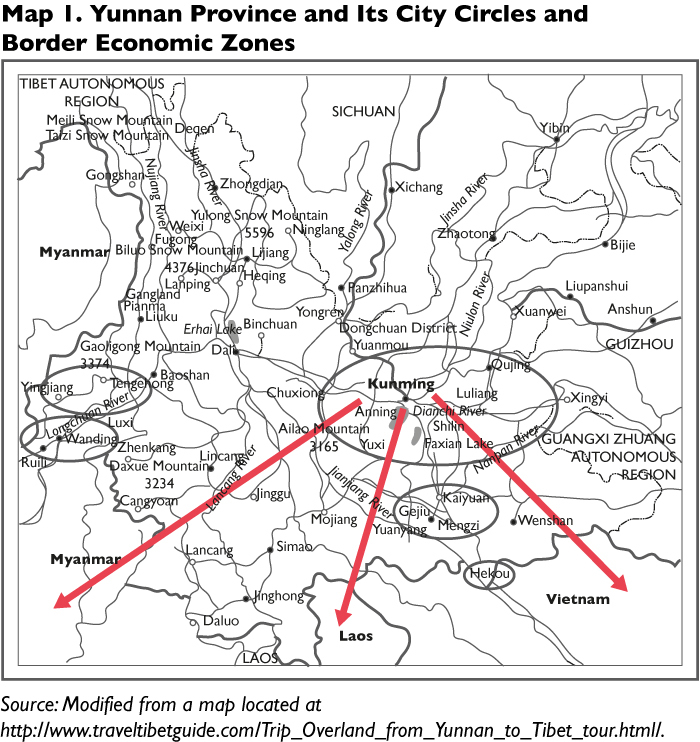 This is a map of Yunnan province, its city circles, and border economic zones. Yunnan borders Vietnam, Laos, and Myanmar.